Photograph of the canalised River Rea near the site of Vaughtons Hole. The photograph was taken from Belgrave Middleway. The bridge carries Gooch Street. 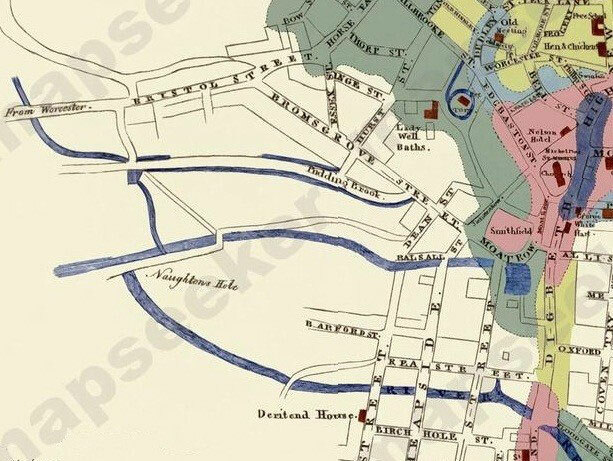 Vaughtons Hole was a wide pool on the Rea where Vaughton Street now bridges the river. The topographical placename element 'hole' may sometimes derive from a number of a different words and meanings. In Old English hol/h is the same as the modern word 'hollow', ie a marked depression in the landscape. In Middle English the word could refer to a valley, especially a narrow one, though surely not the case here in the wide shallow Rea valley. Or it could refer to a deep place or pool, a clear possibility here. Another possible origin is from the Old/ Middle English holm, a term which can have various meanings. It may be used to describe to an island or a peninsula especially in a river. However, here it could well refer to the meadows along a river bank. Water meadows were a valuable commodity. Often flooded in winter, they provided fertile pasture for grazing livestock in the summer. As a pool Vaughtons Hole may have originated as a clay pit. Certainly there was extensive clay deposits in Highgate and Balsall Heath. Indeed, in the 19th century this fact was advertised when land for building development was put up for sale. There were a number of local brickworks, but Harrison's was the biggest. It stood in the area where Gooch Street shopping centre is and supplied bricks for many houses in Balsall Heath and beyond. After the brickworks closed the clay pits were used as a rubbish dump from which methane continues to seep to this day. However, the pool may have derived from a ford across the river. A map of 1838 shows a track from Harrison's brickworks passing straight through the pool. The effect of continual use of a shallow ford was to widen and/ or divert the river. James Drake's map of Birmingham 1825 shows Vaughtons Hole beyond the built-up area of the town. However, the exact nature of the hole is unclear. Image from the Mapseeker website, non-commercial use permitted. See Acknowledgements. I am not the only person living who remembers "Pudding Brook" and "Vaughton's Hole." The name of "Padding Brook" was, in my boyish days, given to a swampy area of fields now covered by Gooch Street and surrounding thoroughfares. Pudding Brook proper was, however, a little muddy stream that flowed or oozed along the district named and finally emptied itself into the old moat not far from St. Martin's Church. Vaughton's Hole, to my juvenile mind, was represented by a deep pool in the River Rea, where something direful took place, in which a Mr. Vaughton was tragically concerned. The real facts are - at least, so I read - that there was a clay pit, sixty feet deep of water, situated near the Rea, and in this pit at least one man was drowned. The place was named after an old local family named Vaughton, who owned considerable property in the neighbourhood of the present Gooch Street. Where Gooch Street now crosses the Rea, I remember there was a footbridge, and beyond that the river was a pretty, purling, sylvan stream, with bushes and rushes growing on its green banks. A field walk past an old farm house led on to Moseley Hall, which was looked upon as being quite away in the country. Vaughtons Hole was a local beauty spot and people came here to swim in the river as late as the 1870s. The old farm house that Anderton passed was Longmoors, recorded in 1608, its site commemorated in the street of the same name. The name is medieval and means long marsh. The River Rea flows for much of its length through a shallow valley over clay, a soil which does not readily absorb water. Along the river were extensive stretches of marshy land which made excellent water-meadows for summer grazing of livestock, but which must have been almost impassable for much of the year. The Rea was notorious for flooding. 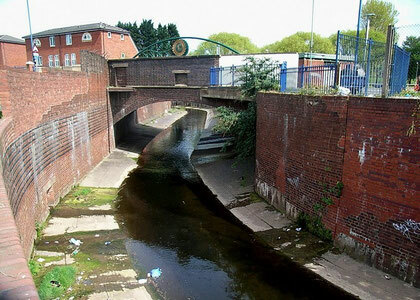 Rain ran quickly off the clay lands and frequently flooded the valleys until the 1900s when the river was gradually culverted from Cannon Hill Park to its confluence with River Tame near Spaghetti Junction. Longmoors was sold in 1869 as housing development moved outwards from Highgate to Balsall Heath. For 19th-century Ordnance Survey maps of Birmingham go to British History Online.